THE OUTER BEZEL IS TO BE PAINTED TO MATCH YOUR INTERIOR COLOR, AND MUST BE MASKED PRIOR TO PAINTING. 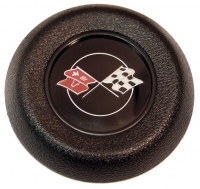 Log In To See Pricing 1968-1975 CORVETTE HORN BUTTON ASSEMBLY WITHOUT TILT & TELESCOPIC. BLACK UPPER LEFT HAND CORNER OF FLAG. GM PART # 3913853. Log In To See Pricing 1967-1982 CORVETTE HORN CONTACT & HORN BUTTON RETAINER - FOR TELESCOPIC STEERING COLUMNS. GM PART # 3949103.